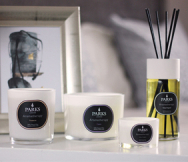 Parks Candles’ Passion Flower Gift Set no. 4 features one of our most popular scent combinations, that of passion flower and vanilla. The set contains all that you need to create a luxurious, relaxing mood in your home, office or any personal space. It includes a bottle of our aromatherapy grade passion flower and vanilla scent, the set includes a natural diffuser, and a high-quality candle with a matching scent. They all come in a matching white ceramic vase. Passion flower has a history that is as exotic as its own scent. Native to Brazil and Argentina, the flower got its extraordinary name from Spanish missionaries who were the first Europeans to discover it. The delicate, yet powerful scent of passion flower is truly unique. It is captivating, yet light and surprisingly sophisticated. Vanilla is the smell of home, of cooking, and a nice piece of shortbread. The flower also comes from the jungles of the New World, so it is no wonder that these two scents merge so well into a single, relaxing whole. These scents come to you in a pure, unmistakable form that can utterly transform your home without leaving any lingering traces or artificial chemicals, as we use only organic essential oils and hand-poured, soot-free, all-natural waxes. This gift set comes in a fine presentation box, which is perfect either wrapped or unwrapped, as the occasion demands. No recipient will fail to be impressed by the obvious effort you have expended to find the very best, or by the hint of exotic floral scents that manage to sneak past its sealed package.